Have you ever had Japanese sashimi? Peruvian ceviche is kind of like that. It’s raw seafood that has been marinated in lime and lemon juices. If you’ve never had raw fish before don’t let the dish scare you. Measures are taken to get rid of the bacteria in the fish. The citrus juices for one are enough to burn off most of it. The dish is also much more than just raw fish. With the red chilies, cilantro, and other ingredients, Peruvian ceviche is a meal that you won’t be forgetting any time soon. If you’re still not sure about going out of your comfort zone to give this dish a try, keep reading for all the reasons why you should. There are a couple of places the dish may have originated from but the most popular theory is the Moche civilization. They made the dish with fermented banana passionfruit juice though. Ceviche was mainly a lunchtime dish at first due to the lack of refrigeration. It was made as soon as fishermen arrived with their catch. Luckily for you, now it can be enjoyed at any time of the day. There are certain types of seafood that do need to be boiled a little before being used in ceviche. These are mainly shellfish like crab or shrimp. Any other fish is kept raw. The fish is marinated in citrus juices for a few hours. While eating raw fish can feel a little daunting rest assured most restaurants only use the freshest of fish from a reputable source. Most restaurants also use professional chefs who know how to make it without giving you food poisoning. Obviously more goes into the dish than raw fish covered in lemon or lime juice. Ingredients like cilantro, onions, tomatoes, chilies, and different types of Peruvian peppers are usually mixed in with the seafood. Keep in mind that different regions use different ingredients for the meal. For example, in Ecuador, you may order it with sweet potatoes if you want. 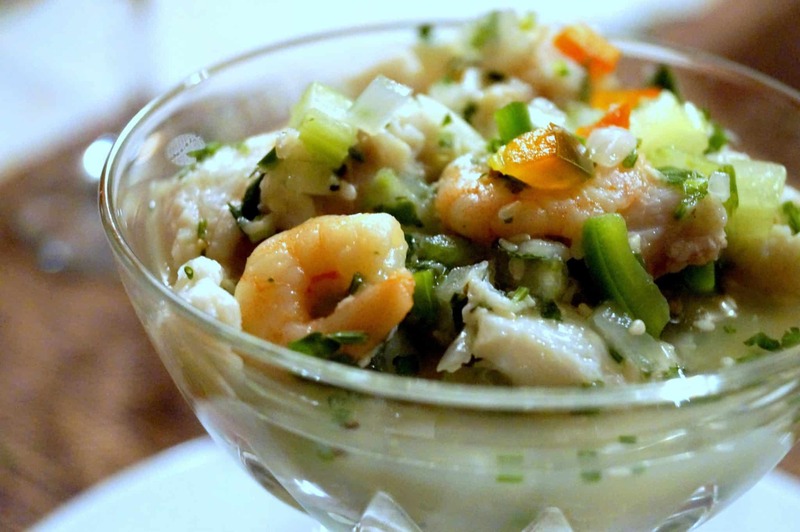 There are many ways that you can eat Peruvian ceviche. You can use it as a dip for crackers or enjoy it on toast or bagel for a spin on your morning breakfast. If you’re looking for a wine to pair with it, anything sweet usually works. Rule of thumb, if it’s seafood, white wine is the way to go. If you’re looking for an interesting food experience you can’t go wrong with ceviche. While raw fish is sometimes a little daunting measures are taken to make sure you enjoy it without getting sick. So put your fears on the back burner, be a little adventurous, and give this Peruvian dish a try! Want to order dessert with your ceviche? Keep reading for all you need to know about Alfajores. Spoiler alert, it’s a famous Argentinean cookie.